The Toronto International Film Festival has come and gone once again, leaving in its wake the standard grumblings of resentment mixed with halfhearted approval that have become its signature. In blocking of a main downtown artery for the better part of a week each year and congesting the entertainment district with blazer-wearing industry mover/shakers and throngs of gawking celebrity-hunters, TIFF effectively becomes a more glamourous and subtle version of the imposition foisted on Torontonians by the much-maligned CNE Airshow. Both are seemingly unavoidable, and completely intolerable if you happen to be uninterested in each event’s respective focus. I enjoy films more than I enjoy screeching planes, but I enjoy screeching planes about as much as I enjoy elbowing through dense crowds and listening to entertainment industry hobnobbers go about their hobnobbing. I must acknowledge my good fortune, however, in being granted the opportunity to take in a number of films at the festival each year as an extension of my employment, as TIFF’s ballooning prices and sense of exclusivity place it increasingly out of the realm of “a reasonable way to spend our free time” for the average Torontonian. Josh and I both managed to see a number of films at this year’s fest, and what follows is a round up of some brief thoughts on what films we saw that managed to make an impression on us. Mark: In this post-The Walking Dead world, I’ll admit to suffering from zombie fatigue. Zombie media is everywhere and most of it doesn’t even approach quality (The Walking Dead included). That being said, I’m always interested to hear about a new film that takes the old zombie tropes and presents them in a fresh or artful way. Sometimes this works, as with last year’s The Girl With All The Gifts. Sometimes you’ll get a result like Maggie, which stars Arnold Schwarzenegger and is painfully dull. Les Affames is somewhere in between those two examples, but I quite enjoyed it. The film doesn’t spend any time at all attempting to explain why the zombie apocalypse has occurred or even provide much hope that survival is an option. It focuses instead on the struggles (emotional and otherwise) of those still living, as they grapple to cope with their situation and try to trust in one another. It’s bleak and grisly, but thoughtfully written and well-performed. Marc-André Grondin from C.R.A.Z.Y. heads up the cast and while he is excellent, the rest of the cast doesn’t allow him to steal the show. The film is also gorgeously shot. The look seems meticulously crafted and this kind of care isn’t seen in your garden variety genre fare. Recommended for horror fans. Mark: Living Proof is at least 3 different documentaries rolled up into one documentary. In its tackling of Multiple Sclerosis, it attempts to be a research/info/background doc about the disease, an activist doc that takes the giant MS charities and big pharma to task, and a personal doc devoted to the fact that the filmmaker suffers from MS. Two of these worked very well for me. One of them really, really did not. Interviews with MS patients and the seemingly hopeless prognosis that they face were very difficult to watch, and the doc does a good job of addressing the gravity of the situation without overstating it or leaning too heavily on melodrama (except when dealing with the director’s situation, but we’ll address that in a moment). Similarly, when the doc goes to work in exposing the obstructionism at play at the hands of the MS Society of Canada in partnership with large drug companies, it delivers invaluable information. It is great, anger-inducing stuff. It all falls apart for me when the film reveals its hand as a bit of a vanity piece for the filmmaker wrapped around this issue. While I don’t disagree with many of the arguments made, this man appears to be saying “I’ve been living with MS for 20 years without any trouble because of this diet my dad came up with, so please inflate my personal brand”. He inserts himself so heavily into the proceedings, and does so in such a preening way, that it undercuts the power of the film’s argument and make it appear as though he is exactly the snake-oil salesman that he purports to be rallying against. I think that it’s important that someone take the MS Society to task for its relationship with big pharma and for it’s baffling imbalance in terms of funding allocation, but I’m not sure that this is the guy to do it. I think that there should absolutely be some proper research and funding put into testing this diet of his, which seems to have truly promising outcomes and is currently ignored by Western bio-medicine, in their insistence that one should eat based on some outdated food pyramid. Lots of great information to be found here. Unfortunately it just wound up leaving a bad taste in my mouth. Mark: I think this film would have made a perfect pick for the Vanguard programme at TIFF (RIP), and seems like an odd Midnight Madness pick. I really enjoyed it. This doesn’t necessarily mean that I think that everyone will. The score and some of the visuals are stunning. I’m not sure that I’ve seen anything quite like them. This, contrasted against some shaky acting and weak dialogue makes it feel like a film that had loads of post-production polish but little oversight in casting and writing. The story of the film is clever (I don’t wish to spoil much of it, if anything), but clever in a way that I’ve seen done a couple of different ways before. The atmosphere is terrifically creepy when the film digs in, and I could see myself re-watching it just to appreciate the sound design and graphics all over again. I’ve been thinking about this movie constantly since seeing it, which is rare for me. Also: Best toddler acting of all-time, maybe? Josh: This pretty delightful little micro-budget genre flick got under my skin. There’s no question director Seth A. Smith has a knack for creating toe-curling atmospherics. His use of sound is oppressive, his framing unsettlingly centred. A lot of The Crescent feels, visually and narratively, like a pastiche of elements we’ve seen before in other films, but as a whole it manages to draw the viewer into a dreamlike state between ultra-realism and a surrealist nightmare, where everything hovers just on the unnerving edge of normal, until it tips off. Josh: What better place than the open road is there to reconcile old grievances and repair broken relationships? Kodachrome is part of a long tradition of father/son stories about reconciliation. The two men hate each other, though it’s hardly a spoiler to say they won’t by the end of the movie. In fact, there’s really not much unsurprising about the movie in general. It plays out entirely as you would expect, but goes to show you that a film can follow a narrative formula and still be satisfying if it has heart, a quality soundtrack, and a great cast. Kodachrome is the kind of movie you can feel comfortable telling your parents to watch, and without the guilt of enabling their bad taste in movies. This is far from a bad movie, but they’ll probably still like it, and they’ll probably cry. Better yet: watch it with your parents. Josh: This debut feature from Toronto filmmakers Aidan Shipley and Grayson Moore, is a confident and idiosyncratic effort, a thriller dressed as an art film. It stars Sheila McCarthy as Valerie Walker, a factory worker and mother whose reintegration into the neighbourhood after a prison sentence for a drunk driving death is complicated by tensions that run hot between Valerie and the son of the man she killed. So much of Cardinals lives in the unspoken words that could change everything for these characters. Often in films the withholding of information from characters feels like a narrative cheat, a way to create tension just by having people not talk to each other when they reasonably should. Here, those unspoken truths simmer, and there are good reasons why they’re left unsaid. We understand the consequences and the reluctance that keep every conversation tinged with uncertainty. Cardinals is an impressive first effort. Josh: Basketball was everywhere in the mid-90s. Between Space Jam and the NBA expansion into Canada, every kid had suddenly (or again) fallen in love with the NBA. That was a new thing for a country that grew up on hockey. Suddenly basketball was exciting, edgy, fresh. The Carter Effect, with a mix of archival footage and interviews, chronicles Vince Carter’s emergence as a hero in Toronto, one who helped put the city on the map. Not only did he turn the struggling Toronto Raptors—at that point a joke in the league—around, but he turned Toronto around, bringing cultural cache and a new sense of identity to the city. The Carter Effect is full of great moments, showcasing both Carter’s athletic skills (the All Star dunk contest in 2000 is a particular highlight), his outsized personality, and his personal triumphs and tribulations. It is fairly surface level in its aims, and suffers at times from a lack of narrative cohesion or chronology, but I can’t imagine those with an interest in basketball or Toronto would come away disappointed. At a slight 60 minutes, it’s breezy, but I found myself wishing for a bit more, just one deeper level of exploration of the role of basketball in Canada, of Vince Carter’s troubled exit from Toronto, anything to really complicate the film’s modest intentions. Josh: This labouriously-titled film is a fairy tale-like story of a Dutch farmer who meets a woman in a refugee camp and promises to come back for her when he’s made a new life in Italy. It’s a fairly charming comic drama for much of its run-time, beautifully shot and flirting with magic realism. I particularly liked the central performance from Dutch actor Gijs Naber as Gauke, a hulking blonde workhorse who enters Italy on a bicycle and a mission. With his stoic physicality and piercing blue eyes, Naber commands the screen like a warmer Mads Mikkelsen. Tulipani feels clearly inspired by films like Amélie, Life Is Beautiful, and Bicycle Thieves. It’s quirky and often very funny, with a low-key warmth to its tale of passion and love, and a rather elegant nesting structure to the narrative. But the third act made me actively hate the screenwriter. It’s a film that feels set to balance tones when the stakes are raised, and then careens into an inconsistent stew of flatulence and extreme violence. There was never much depth to the film before that, but there was a fairy tale’s heart. The climax of Tulipani goes from weighty and disturbing to full-on farce in a matter of seconds. If the central conflict of your movie is going to hinge on a lot of farting, you owe it to your audience to introduce farting early so it’s clear what kind of film you’re presenting. This one is just baffling. Josh: It’s starting to feel like Alexander Payne is incapable of making a bad film. While Downsizing is arguably Payne’s first “misfire,” it’s still a film that’s enjoyable for pretty big chunks of it. The film is based on a premise in which the future of sustainability relies on technology that allows people to shrink to a size of five inches. There’s something fertile in the ground for exploring this great sci-fi idea. “Would you get downsized?” might be an interesting conversation to have with your friends after seeing the movie. The biggest implication, the film suggests, is how reducing one’s size and therefore one’s rate of consumption, conversely increases one’s own comparative net worth. A middle class person in our world can suddenly be an extremely wealthy one in a downsized world, as we see pitched to the central couple, played by Matt Damon and Kristen Wiig. The film touches on the social and economic implications on a broader scale, such as how much influenced the downsized deserve in a world where they’re arguably contributing less to the economy. 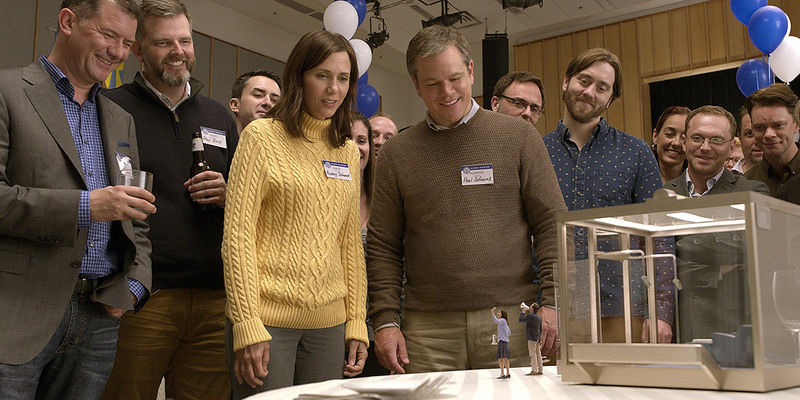 The biggest problem with Downsizing is that over its 135 minutes it loses track of who is the subject of the film. It seems at times to be both Damon’s and Chau’s story (and sometimes both together), but it also seems to want to be a larger parable about human consumption and environmental catastrophe. In that respect, it sort of squanders the potential to be a big existential sci-fi meditation in favour of being a watered down and more conventional version of the personal stories Alexander Payne is so great at telling. Its climax feels way too much like a film you’ve seen dozens of times before, and leaves the movie feeling too small to justify its own big premise. Enjoy the moments in between, though. Payne’s greatness works its way through even a flawed film like this.